The Dragonfly is an insect characterized by large multifaceted eyes, two pairs of strong transparent wings and an elongated body. Dragonflies are usually found near water and immature Dragonflies called nymphs are entirely aquatic. They are general predators feeding primarily on insects such as mosquitoes, flies, bees and ants. 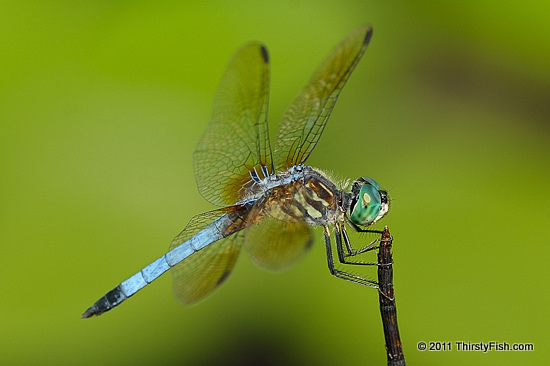 Dragonflies have one of the most impressive flight capabilities of all flying creatures. This photograph was taken during a visit to Longwood Gardens, one of the premier botanical gardens in the United States. The gardens have been continuously open to the public since the early 1800's and they have an interesting history. The estate (Longwood Gardens) played a role in the Underground Railroad network during the Mid-19th Century. The owners at the time, Quakers Hannah and John Peirce Cox, opened their home to escaping slaves and assisted them by providing food, clothes and guidance. There is a book on my reading list titled The Dragonfly Effect. From the reviews, it looks like it is a well written guide to utilize social media to drive social change. [Hmm! That already gave me some ideas]. The title of the book is a twist on the Butterfly Effect, which can be expanded as "the flapping of a butterfly's wings could lead to creation or absence of a hurricane somewhere in the future". The concept is used in Chaos Theory to describe "the sensitive dependence on initial conditions in a nonlinear system". An idea commonly visited on ThirstyFish posts.